This sterling silver buckle has an eagle that is carved out of stabilized compressed block turquoise with white mother of pearl for its head. It also has leaves, fans, swirls and silver drops. 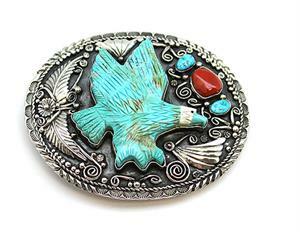 It measures approximately 3 1/2" long by 2 7/8" wide and has a 1 3/4" nickle silver buckle back. Silverwork done by Navajo artisan Bobby Becenti. Eagle carved by Navajo artisan Jefferson Howe. Color shade of turquoise may vary.